Bill - great interview. I haven't seen Matt broadcast yet. Hoepfully he gets to fill in for Shaffer during the week one night or I'll try to catch a weekend show. Thanks. He actually filled in for Shaffer tonight at 6 and 10. I imagine you can go to the WCCO site and catch a glimpse. This guy's got it. His voice is soothing, almost Vin Scullyish. Far more pleasant to listen to than the WCCO weekend weather woman (ugh). I really enjoy the interviews. It's cool to see the path these guys have taken to get to where they are. As a new guy getting into broadcasting (radio), I can relate to doing anything asked by the station in order to stay needed. Good job Bill, hope to see more interviews like this! @JMigz Thanks. Hoping to get a few more soon. Whee...our first slight risk of the Spring. ATTM...IT APPEARS THAT A BROAD ZONE OF RISK FOR SEVERE STORMS WILL EXIST AHEAD OF THE COLD FRONT AS IT ADVANCES ACROSS THE PLAINS...WITH AT LEAST SOME THREAT EXTENDING FROM NRN MN SWD TO THE LOWER RIO GRANDE VALLEY. THOUGH INSTABILITY SHOULD REMAIN FAIRLY LIMITED ACROSS MUCH OF THE AREA FROM ERN OK NWD...FAVORABLE SHEAR AND FAIRLY STRONG LOW-LEVEL FORCING SHOULD SUPPORT VIGOROUS STORMS CAPABLE OF PRODUCING LOCALLY DAMAGING WINDS AND HAIL. Just posted a new thread to discuss current weather. Watching Matt for the first time this morning and his great style and likability peaked my interest to google him. What a refreshing change from what I've always felt is a very bland landscape of newscasters across all networks. This guy is great - seems authentic and is very relaxed and upbeat at the same time without going over the line to annoying (like Eric Perkins who tries waaay to hard). I fully expect to see Matt move to bigger markets down the road with his personality. Nice to have someone who appeals to a broad audience including the "younger" market. 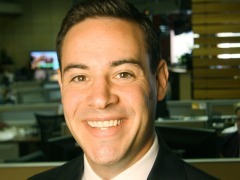 I'm officially switching from Kare 11 to wcco when Matt's on. (Hope to see him in prime time slots soon before another city scoops him up). @Anonymous Agree! Thanks for your comment. Great job on the interview. I actually saw Matt doing a report in downtown lunds and byerlys today. Really like his personality!